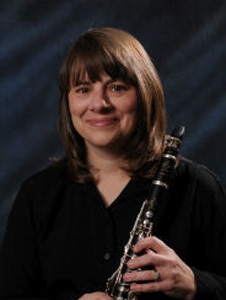 Pam Diaz is the Applied Clarinet Instructor, Clarinet Choir Coach, and member of the Faculty Woodwind Quintet at Colorado State University-Pueblo. She holds the position of co-principal clarinet in the Pueblo Symphony Orchestra and principal clarinet in the Rocky Mountain Wind Symphony. An active chamber musician, she has performed on numerous recitals and concerts in the Front Range region, and is a founding member of the Underground Clarinet Quartet. A native of Michigan, Pam graduated from the Interlochen Arts Academy, where she was principal clarinetist. She performed Debussy's Premiere Rhapsodie with orchestra as a winner of the Michigan Youth Arts Festival Competition. She received her Bachelor of Music degree from Northwestern University, and her Master of Music degree from the University of Michigan, which awarded her a full-tuition fellowship. She also performed in the Grand Teton Orchestral Seminar in Wyoming. Pam's principal teachers have included Burt Hara, Fred Ormand, Russell Dagon, Clark Brody, Robert Marcellus and Frank Kowalsky. After years of teaching in Houston, TX, Pam moved to Colorado Springs in 2006 with her husband and 3 children.